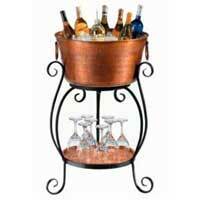 We are looked upon as one of the reliable Antique Copper Handicrafts Items Manufacturers in India. The copper used in the manufacturing of the Copper Handicraft Items ensures high durability, tensile strength, resistivity to corrosion and low maintenance cost. Additionally, customers are facilitated with the availability of the Copper Marvel Handicrafts Item in varied sizes, shapes and dimensions confirming to the specifications provided.